Cornish cider (or should that be cyder?). It isn’t something that I have reviewed much in the past, so I leapt at the chance of acquiring a bottle of this rather classy cider. The producers, Healeys, have been in business for 25 years and most famously produce Cornish Rattler. …in Cornwall, dreckly means mañana but without the sense of urgency. That’s how we make our premium classic cyders. The taste is on the sweet end, not as much so as the Sheppys Falstaff that I sampled whilst on holiday earlier in the year, but still sweeter than I would usually go for. After the initial sweetness there is a lovely tannin hit which gives way to an aftertaste that seems somehow sweet again. 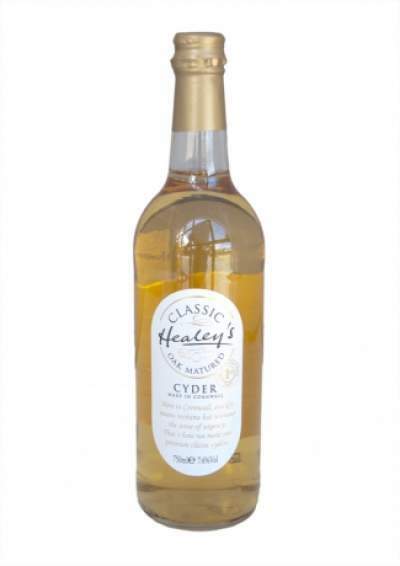 Healeys Classic Oak Matured Cyder has 7.4% alcohol by volume, but its light, rounded character means that it doesn’t have that rough edge that some ciders can have (don’ get me wrong, I *like* that!). But you will want to be careful when supping it!